The California Department of Social Services asked RAND to study the state1s policy for sanctioning welfare program participants who do not comply with statutory requirements of the welfare-to-work program. 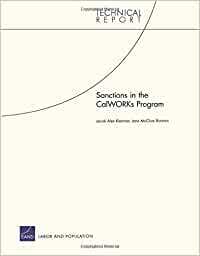 Researchers found that sanctions were weak in practice and that caseworkers were reluctant to sanction clients. Making sanction swifter, stronger, and safer are possible directions for reforming sanction policy and practice. Reports on a study of California's policy for sanctioning participants who do not comply with statutory requirements of the welfare-to-work program.